Open living spaces, adaptable furniture and an indoor garden helped Nitton Architects create a homely apartment inside a tightly-packed residential block in north-east Singapore. 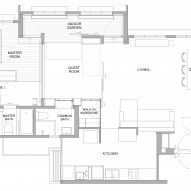 The apartment – which is aptly titled House in a Flat – is situated in the town of Sengkang, set within an 800-unit residential development. It belongs to Liting Lee, founder of local practice Nitton Architects, and her husband Khoon Toong Chow. 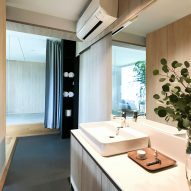 Interested in exploring the different ways in which people can live in densely-populated locations like Singapore, Lee and Chow overhauled the property to try and create "a mini house out of a humble flat unit". "We wanted a seamless flow of light and space emulating the experience of landed housing that goes beyond the typical confines of apartment living," Lee told Dezeen. The pair began by removing all of the apartment's non-structural walls, forming an open-plan layout intended to counteract the "crowdedness of urban living". The apartment's master bedroom is now only divided by a full height wardrobe, which separates the bed from a small vanity area. Two beds in the guest room have also been tucked away to give the impression of more space. While one slides out from beneath an oakwood deck that runs along the apartment's front elevation, another can be folded down from the wall. 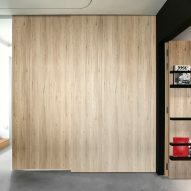 Privacy is provided by panels of laminated plywood that can be slid across to conceal the sleeping quarters. A curtain fixed to a curved track can also be drawn to hide the master bedroom's ensuite. The apartment has been finished with white-painted surfaces, pale grey furnishings and a cement-like floor covering. Touches of warmth are provided by timber dining chairs and full-height gridded shelving units that have been integrated into the periphery walls. "The simple colour palette blends in with the rather abstract, atmospheric qualities of the interiors, and accentuates a sense of calmness," explained Lee. A former corridor in the apartment has also been transformed into an indoor garden that features a greenery-filled windowsill planter, offering inhabitants another spot to relax. Portuguese practice Fala Atelier took a similar approach to Nitton for the overhaul of a cramped flat in Lisbon, where they removed all interior walls and introduced a handful of mirrored and glass doors to create a seemingly more open family dwelling. Photography is by Sweng Lee.